Format: Paperback book (215 pages). 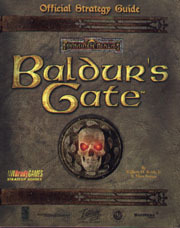 This official strategy guide provides hints on the Baldur's Gate computer game by Interplay Productions. 'A complete walkthrough of the game as told through the journal of the fighter-mage Diana Nightflame. Discover the solutions to all the complicated riddles, and uncover the hidden secrets in the game. Delve into the mini-quests and non-player characters that you will encounter during the grand quest'.